Our iCreate Software is developed exclusively for Westcoast UK and is going from strength to strength. It’s latest release includes an exclusive customised-to-order (CTO) initiative for education-focused channel partners. The configuration tool enables resellers, or their end-user schools, colleges and universities, to design and build their own bespoke HP desktop PCs – and then receive delivery within 48 hours of their order! The software can be integrated into the website or e-commerce platforms of Westcoast’s partners. Westcoast partners can rebrand the software to fit with their own colour-way and even add in their own services. 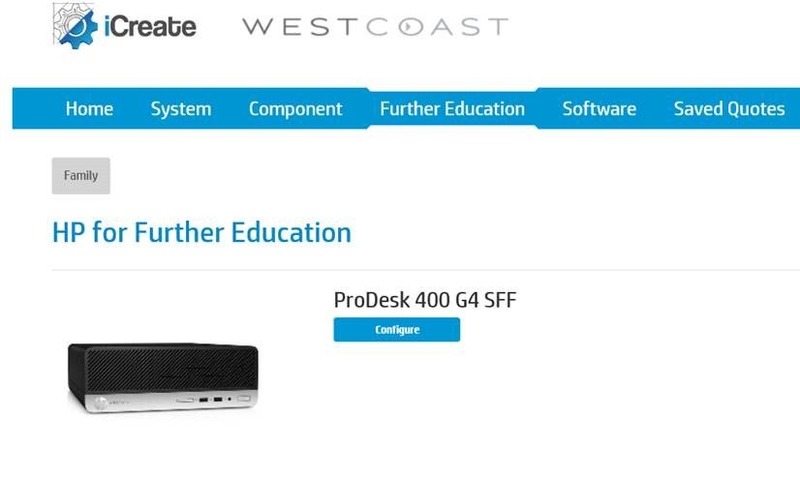 Initially, the CTO tool can be used to configure desktop PC systems but Westcoast and HP are planning to add laptops and other products in the short term. The latest release has been picked up by channel press and is set to be a highly utilised tool by Westcoast’s channel partners. HP ProDesk 490 G3 Microtower PC. HP ProDesk 490 MT has been designed with essential security and manageability features. HP BIOSphere and HP Client Security boost security and keep critical data and systems under lock and key with customizable authentication and BIOS-level passwords. The ProDesk 490 comes complete with Intel® Core™ processors, bringing powerful processing with Intel® HD 530 Graphics. Available DDR4 memory helps meet the demands of today’s businesses. ● Maximize management and productivity features for business with Windows 10 Pro. ● Reduce the complexity of administration – HP Touchpoint Manager. ● Make conferencing from your PC as simple as the touch of a button with the optional HP Conferencing Keyboard. ● Tool-less chassis to easily upgrade memory, storage, and graphics to meet diverse and growing business needs. ● Reduce energy consumption and costs with ENERGY STAR® and EPEAT® Gold8 certified configurations. ● Manage data, security, and devices from a single cloud-based solution with HP Touchpoint Manager. ● Simplify technical support with Helpdesk by HP Care. Rely on cost-effective expertise that’s available 24×7, covering multiple brands, devices and operating systems.